Today, the world lost a beautiful and talented woman. Maya Angelou stood the test of time; a poet, writer, singer and dancer extraordinaire - Angelou was truly an inspiring soul. 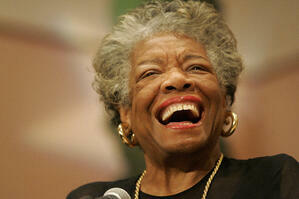 Angelou is best known for her series of seven autobigraphies, which focus on her childhood and early adult experiences. Spanning more than fifty years, Angelou has published seven autobiographies, three books of essays, and several books of poetry, and is credited with a list of plays, movies, and television shows. This strong woman not only overcame the hardships of her own life but also offered the wisdom needed for other women, teenagers and children to overcome their own. This wisdom can easily be translated to business and marketing - in order to help professionals build momentum and gain success. Without further ado, here are twelve inspirational quotes from Maya Angelou that can applied to business and life. 1. If you don't like something, change it. If you can't change it, change your attitude about it. 2. If you only have one smile in you give it to the people you love. 3. Nothing will work unless you do. 5. You may not control all the events that happen to you, but you can decide not to be reduced by them. 6. I've learned that people will forget what you said, people will forget what you did, but people will never forget how you made them feel. 7. The idea is to write it so that people hear it and it slides through the brain and goes straight to the heart. 8. Surviving is important, thriving is elegant. 9. Try to be a rainbow is someone's cloud. 10. One isn't necessarily born with courage, but one is born with potential. Have a favorite quote? Let us know in the comments!